President Monson tells how building a strong testimony is like building a strong road. In 1959, I met N. Eldon Tanner (1898–1982), who later would be a counselor to four Presidents of the Church. President Tanner was president of the Canada Calgary Stake. We discussed the cold Canadian winters, where temperatures can linger well below freezing and icy winds lower those temperatures even further. I asked President Tanner why the roads in western Canada remained intact during such winters, showing little or no signs of cracking or breaking, while road surfaces in many areas where winters are less cold and less severe developed cracks and breaks and potholes. Challenges and difficulties can break us if our foundations of faith, our testimonies of truth, are not deeply embedded within us. How can we gain and maintain the foundation needed to survive spiritually? May I offer three guidelines to help. 1. Prayer. When we remember that each of us is literally a spirit son or daughter of God, we will not find it difficult to approach Him in prayer. He knows us; He loves us; He wants what is best for us. 2. Scriptures. Spending time each day in scripture study will strengthen our foundations of faith and our testimonies of truth. 3. Service. There are others who need your help. In the Book of Mormon we read of noble King Benjamin. He declared: “When ye are in the service of your fellow beings ye are only in the service of your God” (Mosiah 2:17). We can fortify our foundations of faith, our testimonies of truth, so that we will not falter, we will not fail. Building Something Strong: 1.) faith, 2.) others, 3.) noble, 4.) daughter, 5.) Tanner, 6.) intact. Missing word: foundation. Serving All His Life: 1.) 15, 2.) 22, 3.) 27, 4.) 36, 5.) 58, 6.) 68, 7.) 81. Find words from President Monson’s message to fill in the blanks below. Then write the first letter from each word in the blank on the road above to spell a word that tells what we are building when we follow President Monson’s three guidelines. When we have challenges, our ___ ___ ___ ___ ___ can help us be strong. President Monson said we should serve ___ ___ ___ ___ ___ ___ who need our help. King Benjamin was a ___ ___ ___ ___ ___ prophet. It’s not hard to pray when we know we are a spirit son or ___ ___ ___ ___ ___ ___ ___ ___ of God. President Monson met President N. Eldon ___ ___ ___ ___ ___ ___ in Canada. First: A bulldozer drives over the dirt, leveling bumps and filling in dips. Next: A sprayer puts water on the dirt, and a roller presses it down. Then: A 12-inch layer of gravel is added. Workers put water on the gravel and press it down. Then, more layers of gravel are added. The more layers, the stronger the road. Last: Asphalt or concrete is spread on top to make the road smooth for cars and trucks to drive on. Prayer, scriptures, and service will give your road through life a strong foundation. 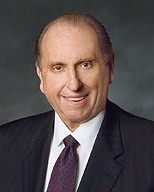 President Monson was called as mission president of the Canadian Mission when he was 31 years old. Draw a line from the Church calling to the age President Monson was when he first held that calling. What can you do at your age to serve others in the Church?